For the American inventor, see John Wesley Hyatt. For the English Wesleyan minister, see John Hyatt (clergyman). John Robert Hiatt (born August 20, 1952) is an American rock guitarist, pianist, singer, and songwriter. He has played a variety of musical styles on his albums, including new wave, blues and country. Hiatt has been nominated for several Grammy Awards and has been awarded a variety of other distinctions in the music industry. He remains one of the most respected and influential American singer-songwriters. Hiatt was working as a songwriter for Tree International, a record label in Nashville, when his song "Sure As I'm Sittin' Here" was covered by Three Dog Night. The song became a Top 40 hit, earning Hiatt a recording contract with Epic Records. Since then he has released 22 studio albums, two compilation albums and one live album. His songs have been covered by a variety of artists in multiple genres, including Bob Dylan, The Searchers, Delbert McClinton, Willy DeVille, Ry Cooder, Linda Ronstadt, Bonnie Raitt, Eric Clapton, B.B. King, Joe Bonamassa, Willie Nelson, Three Dog Night, Joan Baez, Paula Abdul, Buddy Guy, the Desert Rose Band, Jimmy Buffett, Mandy Moore, Iggy Pop, Emmylou Harris, Rodney Crowell, Dave Edmunds, Nick Lowe, The Nitty Gritty Dirt Band, Rosanne Cash, Suzy Bogguss, Jewel, Aaron Neville, Jeff Healey, Keith Urban, Joe Cocker, Chaka Khan, Paulini and many others. The Dutch singer/songwriter Ilse DeLange recorded the album Dear John with nine of his songs. Hiatt was born in 1952 to Ruth and Robert Hiatt, the sixth of seven children in a Roman Catholic family from Indianapolis. When he was nine years old, Hiatt's 21-year-old brother Michael committed suicide. Only two years later, his father died after a long sickness. To escape from the stress of his early life, Hiatt watched IndyCar racing and listened to Elvis Presley, Bob Dylan, and the blues. In his youth, Hiatt reports that he and several others stole a Ford Thunderbird, a crime for which he was caught by the owners but got away with, posing as a hitchhiker. He learned to play the guitar when he was eleven, and began his musical career in Indianapolis, Indiana as a teenager. He played in a variety of local clubs, most notably the Hummingbird. Hiatt played with a variety of bands, including The Four-Fifths and John Lynch & the Hangmen. He moved to Nashville, Tennessee when he was 18 years old and got a job as a songwriter for the Tree-Music Publishing Company for $25 a week. Hiatt, who was unable to read or write scores, had to record all 250 songs he wrote for the company. He also began playing with the band White Duck, as one of three singer-songwriters within the group. White Duck had already recorded one album before Hiatt joined. He wrote and performed two songs on their second album, In Season, one of which was the hit "Train to Birmingham" (1972). Hiatt performed live in many clubs around Nashville with White Duck and as a solo act. Hiatt met Don Ellis of Epic Records in 1973, and received a record deal, releasing his first single, "We Make Spirit", later that year. That same year Hiatt wrote the song, "Sure As I'm Sitting Here," which was recorded by Three Dog Night, and went to number 16 on the Billboard chart in 1974. In 1974 he released Hangin' Around the Observatory, which was a critical success but a commercial failure. A year later, Overcoats was released, and when it also failed to sell, Epic released Hiatt from his contract. For the next four years he was without a recording contract. During this time his style evolved from country-rock to new wave-influenced rock in the style of Elvis Costello, Nick Lowe and Graham Parker. Hiatt was picked up by the MCA label in 1979. He released two albums for the label – Slug Line (1979) and Two Bit Monsters (1980) – neither of which met with commercial success. He received a few good reviews for these albums by critics in the Netherlands. He performed at the Paradiso in Amsterdam for the first time in 1979 (opening for Southside Johnny & The Asbury Jukes) and came back often and built a solid fan base. In 1982, "Across the Borderline", written by Hiatt with Ry Cooder and Jim Dickinson, appeared on the soundtrack to the motion picture "The Border", sung by country star Freddy Fender. The song would later be covered on albums by Willie Nelson, Paul Young, Rubén Blades and Willy DeVille, among others, as well as by Bruce Springsteen and Bob Dylan in concert. Hiatt was signed to Geffen (which would later absorb MCA) in 1982, where he recorded three diverse albums from 1982 to 1985. The first, All of a Sudden, was produced by Tony Visconti, and featured use of keyboards and synthesizers; his future albums combined country and soul influences. Riding With the King appeared in 1983, produced by Scott Mathews, Ron Nagle and Nick Lowe. Hiatt began making "critics choice" lists and building a large European following. The title track of Riding With the King (taken from an odd dream Scott Mathews had) was re-recorded two decades later by Eric Clapton and B.B. King and went double platinum. During this period, Rosanne Cash covered several Hiatt compositions, taking "It Hasn't Happened Yet" to the Top 20 on the country charts. In 1983, Cash would duet with Hiatt on his "The Way We Make a Broken Heart" produced by Mathews and Nagle. When Geffen failed to release the single, Cash re-recorded it in 1987 and it went to No. 1 on the US country charts. Ricky Nelson also covered "It Hasn't Happened Yet" on his 1981 album Playing to Win. Hiatt recorded a duet with Elvis Costello, a cover version of the Spinners' song, "Living A Little, Laughing A Little", which appeared on Warming Up to the Ice Age. Shortly after its release, Bob Dylan covered Hiatt's song "The Usual", which had appeared on the soundtrack to the film, Hearts of Fire. However, Geffen dropped Hiatt from the label after Ice Age failed to chart. Hiatt finally came into success in 1987, when he released his first big hit, Bring the Family. For the album, Hiatt had a backing band consisting of Ry Cooder, Nick Lowe, and Jim Keltner. Most of the songs on the album have since been extensively covered, especially "Have a Little Faith in Me," which has been covered by a number of artists, including Joe Cocker, Delbert McClinton, Jewel, Bill Frisell, Mandy Moore and Bon Jovi; and "Memphis in the Meantime", which has been covered by Carl Perkins and Gregg Allman. "Thank You Girl" was a moderate radio hit, but nothing that would garner Hiatt national attention, although the B-side of the single featured a non-album duet with Loudon Wainwright III on a cover of the Temptations’ hit "My Girl" (Hiatt returned the favor on the B-side of Wainwright's single "Your Mother and I"). Most notably, Bonnie Raitt would bring "Thing Called Love" to No. 11 on the US charts with her 1989 release, Nick of Time. Following Bring the Family, Hiatt had a string of nine straight studio albums hit the Billboard 200. In 1988, he returned to the studio to record Slow Turning, which would be his first album to hit the upper half of the Billboard 200. It also featured his only top ten chart single, the title track, which hit No. 8 on the Mainstream Rock Tracks chart, and "Tennessee Plates", which was used in the soundtrack of the Ridley Scott directed and Academy Award winning film Thelma and Louise in 1991. In 1989, The Jeff Healey Band covered the Hiatt-penned song "Angel Eyes" and took it to the Top 5 of the Billboard Hot 100. In 1992, Cooder, Keltner, and Lowe again backed up Hiatt, but this time they gave themselves a band name, Little Village, a reference to a Sonny Boy Williamson II song. Expectations for the Little Village album were high, but the album failed to even chart as high as Hiatt's last solo album, and the group disbanded after an only moderately successful tour. In 1993, Hiatt recorded Perfectly Good Guitar with members of alternative rock groups School of Fish and Wire Train. Hiatt recorded the album with producer Matt Wallace, who had worked most prominently with Faith No More, a band that Hiatt's 15-year-old son Rob had recommended for him. It was Hiatt's highest peaking album at No. 47, but again was still not the true commercial breakthrough A&M expected. In 1993, Love Gets Strange: The Songs of John Hiatt, a compilation album of covers of Hiatt's songs was released. This was followed by an album of original covers Rollin' into Memphis: Songs of John Hiatt in 2000, and a second compilation album with a few originals, It'll Come To You...The Songs of John Hiatt, in 2003. In 1994, Hiatt released Hiatt Comes Alive at Budokan?, his first official live album and his last album with A&M Records. A CD and DVD of his performance on Austin City Limits was released in 2005. Hiatt had previously released two promotional live promotional "official bootlegs", Riot with Hiatt in 1985, and Live at the Hiatt in 1993, as well as the EP Live at the Palace in 1991. Hiatt received his first Grammy nomination in 1995 for his album Walk On. Hiatt's next few albums never gained any momentum on the charts, and he saw little change in his fanbase in the late 1990s, indicating a dedicated following. In 2000, Hiatt released his first independent album on Vanguard Records, Crossing Muddy Waters, which saw a heavy influence of bluegrass in his music. Later that year, he was named songwriter/artist of the year at the Nashville Music Awards. In 2001, Crossing Muddy Waters was nominated for a Grammy Award for Best Contemporary Folk Album, with Davey Faragher and David Immerglück as his only accompanists. In 2002, Hiatt performed several songs for the soundtrack of the Disney's The Country Bears movie, representing the voice of the lead singer. The movie also featured covers of Hiatt songs by Bonnie Raitt and Don Henley. Hiatt's album, Master of Disaster, was released on June 21, 2005. The album was produced by Jim Dickinson, and Hiatt was backed up by the bassist David Hood and several members of the North Mississippi Allstars. The album achieved modest sales, becoming a top ten independent album, but failed to achieve significant commercial success. On February 12, 2008, during a concert with Lyle Lovett at the National Arts Centre in Ottawa, Canada, Hiatt said that his new album would be titled Same Old Man. It was released on May 27, 2008. On July 18, 2008 Hiatt performed at Ravinia Park in Highland Park, Illinois, with his daughter, Lilly. In August 2009 he appeared in Levon Helm's Ramble at the Ryman singing "The Weight" at the historic Ryman Auditorium, in Nashville. In March 2010, Hiatt released The Open Road. Hiatt appears as a performer in The House of Blues in the sixth episode of the second season of Treme, with the episode title taken from his song Feels Like Rain. The episode aired May 29, 2011. Hiatt presented an Americana Lifetime Achievement Award to Bonnie Raitt on Sept. 12, 2012. The two performed "Thing Called Love" together at the ceremony. On September 25, 2012, Hiatt released Mystic Pinball, his 21st studio album. Also on September 25, 2012, Joe Bonamassa released in the US Beacon Theatre: Live From New York, which included Hiatt playing "Down Around My Place" and "I Know A Place". On July 15, 2014, Hiatt released Terms of My Surrender, his 22nd studio album. 1 2 3 4 5 6 7 8 9 10 11 12 13 14 Strong, Martin C. (2000). The Great Rock Discography (5th ed.). Edinburgh: Mojo Books. pp. 446–447. ISBN 1-84195-017-3. ↑ "John Hiatt". Amazon.com. 2007-04-22. Retrieved 2012-04-10. ↑ "Rocker John Hiatt: As Good As His Words – New York Times". Nytimes.com. 1989-03-12. Retrieved 2014-07-10. 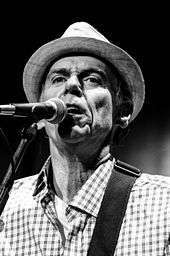 1 2 "Rolling Stone Online: John Hiatt Interview". Unicom.com. 1997-06-29. Retrieved 2014-07-10. ↑ Hopkins, Renee (March 3, 1994). "Joys of Bust-'em-up Rock". The Dallas Morning News. ↑ Walker, Dave (May 29, 2011). "'Treme' explained: 'Feels Like Rain'". The Times-Picayune. In the 1981 Friday the 13th parody called Saturday the 14th, actor Richard Benjamin plays a character called John Hiatt. "Have a Little Faith in Me"
"Sure As I'm Sittin' Here"